with Earlybird Orders over $700. * Orders over $700 (excluding freight) receive 1 BBQ Set. Offer for Earlybird orders received by 30th June 2018. Here’s a great use for your BBQ Set – Consider holding a raffle. Everyone loves to win a prize!! Raffles or Barrel Draws are a wonderful way to create a real ‘buzz’ around your Father’s Day Stall and also to raise a few extra dollars for your school. 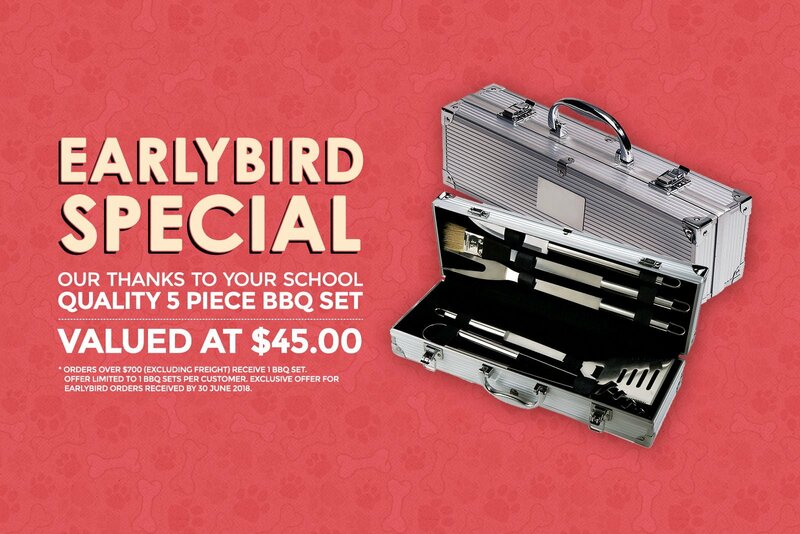 You may like to sell raffle tickets to win this quality BBQ Set at your stall for 50c – $1.00. You may like to be really creative and include the BBQ Set within a larger ‘Blokes Basket’ full of treats for Dad, including items like the Apron, Picnic Blanket and The Big Chill Cooler. Or, your school may choose to give the BBQ Set to a special Dad within your school community who would benefit from a ‘big hug’. You may wish to keep it in your school’s kitchen, for use at your next community BBQ. Whatever you choose to do with this quality 5 Piece BBQ Set, it’s our way of saying thank you. Please Note: There is a knife contained within the BBQ Set so we would suggest that if this gift is won in a raffle, you ensure it is carried home by a parent or carer and not a student.